Lately, I’ve been all about the attitude of “quality over quantity”. I’ve been selling a lot of my general release Jordans, LeBrons, and other underwhelming shoes in search of something a little more exciting. 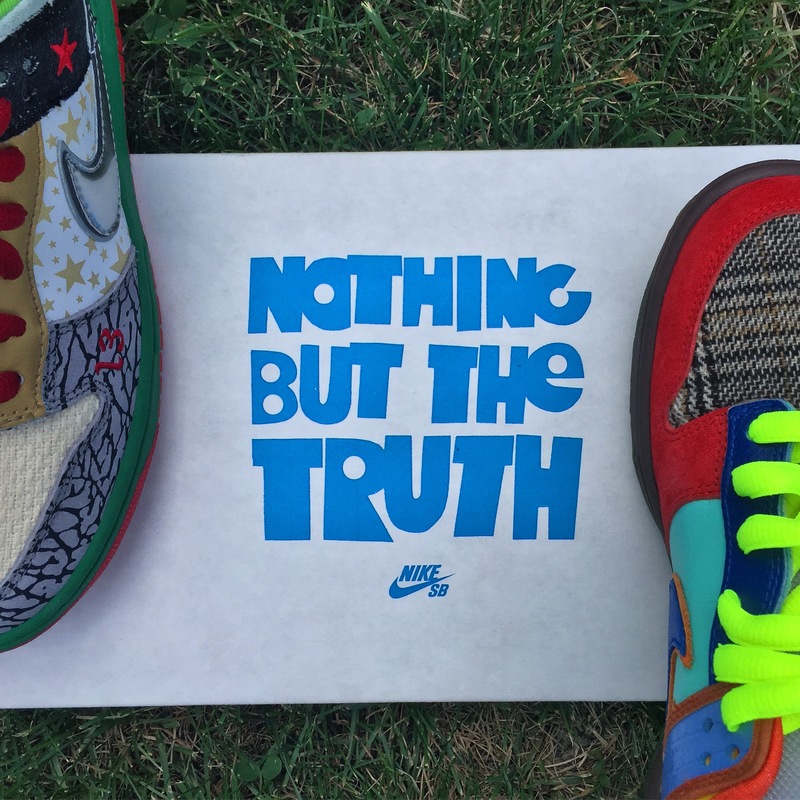 This brings me to the story of how I recently attained one of my long-time ‘grails’ – What The Dunks. What The Dunks have always been on my radar; the over-the-top and outlandish look of a patchwork shoe that resembles your grandmothers old quilt really appeals to me. 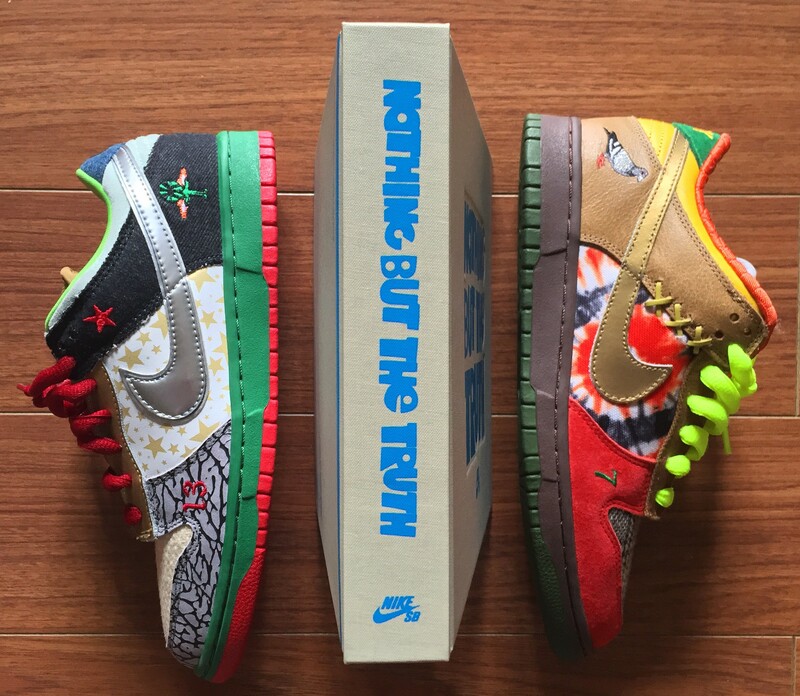 I have picked up other ‘What The’s’ in the past, but they just didn’t have the “WOW” factor that the Dunks bring with them. A few months ago, I stumbled upon an article about famed shoe collector Shoezeum selling his What the Dunk collection. 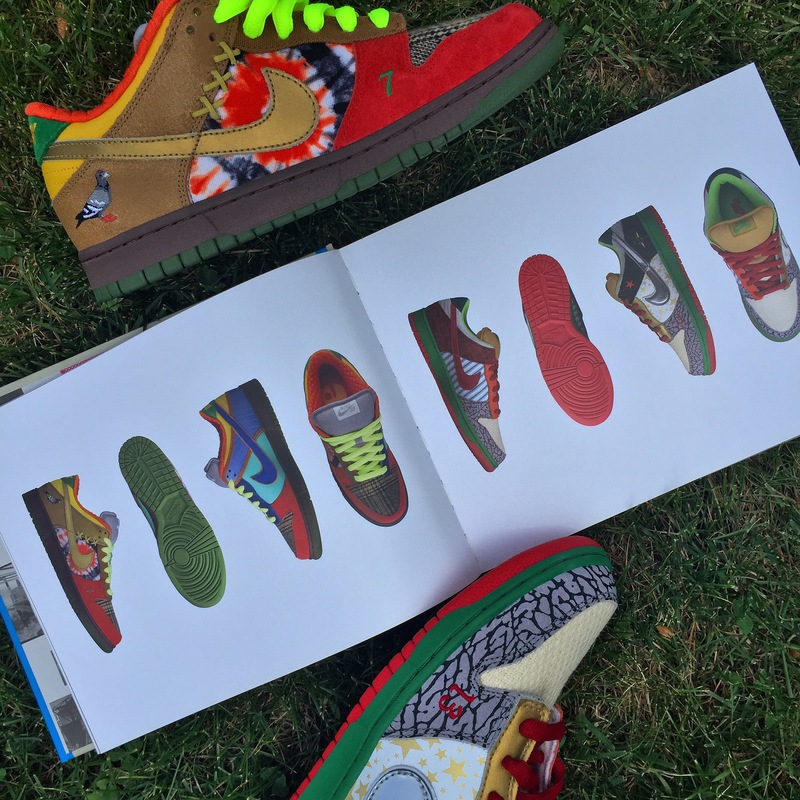 Now this wasn’t just any ordinary collection of a few deadstock pairs of WTDs; this was a $100,000 eBay listing for three pairs of the shoe, PLUS a deadstock pair of every shoe that went in to the making of the actual What the Dunks. Hyperlinked to this eBay listing was a 30 minute video of Mr. Shoezeum walking through and giving an overview of each and every one of these shoes. Now of course, I watched the video, and the entire time I was falling deeper and deeper in love with this marvellous shoe. So – the hunt was on. For the next couple weeks I scoured Kijiji, eBay, Facebook groups, ISS; anywhere I could possibly think of that I may find my new grail lurking. Finally, I posted in a local Facebook group, stating that I was looking for a pair, and I received a response. “I think Adrift has a size 10 in their consignment section”, one comment said. As I was smitten with joy, I was quickly disheartened at the next commenter wrote “I just bought that size 10 a week ago”. Damn. So close yet so far. About a week later, I was casually creeping a local reseller’s Instagram (@Netmagnetism), and I noticed that 68 weeks ago they posted a size 8.5 in their inventory. Not expecting anything from it, I commented on the year and a half old post, asking if it was still available. Not more than five minutes later I received a reply. “We’ve had it in our storage, shoot us an email”. Cha-ching. Back on track. After exchanging a few emails and deciding on a price, the boys over at Netmagnetism threw out another curve ball. They were willing to trade a size 10 for their size 8.5. Did I know anyone with a size 10? Yes. Could this possibly help me save a few dollars? Quite possibly. Seeming as if Yeezus had read this email himself, the next day, the same size 10 that was purchased from the Adrift consignment section was up for sale on Facebook. I instantly flooded the dude’s inbox asking to purchase the shoes. And like a true champion, he agreed not only to sell me the shoes for what he paid ($100 cheaper than Netmagnetism’s price), but that he’d also throw in the book that released alongside the shoes – free of charge. Now throughout this whole process you might have assumed I had a bucket of money I was trying to unload to purchase these shoes – and you couldn’t be any more wrong. When both parties agreed to meet me on the same Saturday (a week away), I not only had no money saved up for these shoes, but I had exams to study for and a wedding to attend. Welp. Here we go. Over the next week I posted about a dozen shoes for sale. I was meeting people daily to sell kicks I no longer wore so that I could afford to buy my prized What The Dunks. One week, 1.6 thousand dollars later and I was ready. My last meetup actually came only 30 minutes before I was supposed to buy the size 10 pair of What The Dunks. We met downtown, right outside of Ryerson University. He pulled out the shoes and the book and my heart shot through the top of my head. I had about a 15 minute conversation with my new friend about shoes, releases, the community, and of course – What The Dunks. But I had to cut it short because I was scheduled to meet Netmagnetism 30 minutes after that to trade for my 8.5. I met up with him in the parking lot of an Ikea in North York (about 20km’s north of the city). This was my second transaction with Netmagnetism and they are nothing but a class act. We swapped the shoes, had a mini conversation beside the open trunk door of his white Mini Cooper and we went our separate ways. If I could go back and do it again I wouldn’t have it any other way. I was able to meet almost 20 new people during this venture. I was able to see a sense of community and generosity. I was able to learn new things about a shoe I thought I knew lots about already. I got to experience paying way too much for a pair of shoes I will rarely wear. 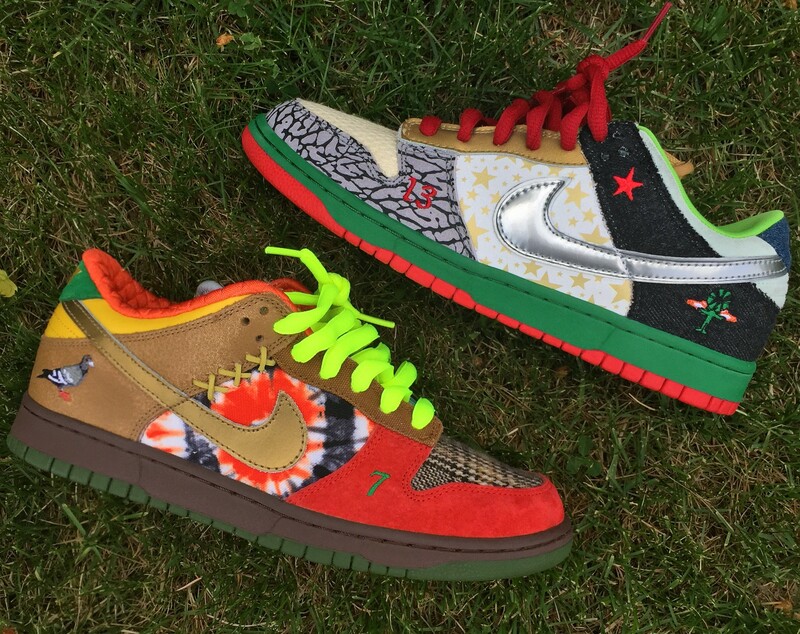 But in it all – I got my What The Dunks.